Mechanical sealings fit with the needs of ail industrial activities such as chemistry, petrochemical industry, petroleum industry, paper industry, processing industries, food industries, agrifood industry, textile industry, pharmaceutics. Mechanical seal is accordingly an essential part of ail rotating machinery such as pumps, compressors, mixers, gasturbine, centrifuges, clarifiers, refiners, reactors. However, performances given by manufacturers of mechanical seals can be affected by number of external causes and particularly lacks of assembly, defects in lining-up the line-shafting. 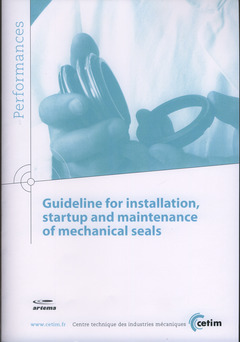 Consequently, association of manufacturers of mechanical seals belonging to Artema, in business partnership with the Cetim, published this definite and didactic guide, which aim is to actually help users and maintenance services, for a successful assembly and a better performance of their installations.